On Monday, the state of Virginia instituted a high-occupancy toll lane on a 10-mile stretch of Interstate 66 inside the DC beltway. The lane was previously just for high-occupancy vehicles, but the new tolls give solo drivers the option to use it, for a price. How much of a price? Well, it hit $34.50 Monday morning, according to The Washington Post, which is about 6.5 cents for every 100 feet. The price is variable, and has no cap, so it could presumably go higher. It’s set by roadway sensors, which measure the speed at which traffic is moving and adjust the price accordingly. It was thought that it might be around $10 during rush hour, but no one was really sure. “It is a dynamic toll,” said Jenny McCord, a spokeswoman for VDOT. “It will vary and fluctuate based on the demand.” Other times, she noted, the toll was in the low $20s. The toll changes every six minutes. There is no toll for vehicles carrying two or more people, and there are also no tolls when it’s not rush hour, which is defined as 5:30 a.m. to 9:30 a.m. eastbound and 3 p.m. to 7 p.m. westbound. Indeed, on its face, the tolls seem slightly ridiculous, but this is the kind of thing that we need more of—tolls that reward good behavior like carpooling, and discourage driving alone to work. And if you’re willing to pay double-digit money to get to work slightly faster, you should have that right, I suppose. 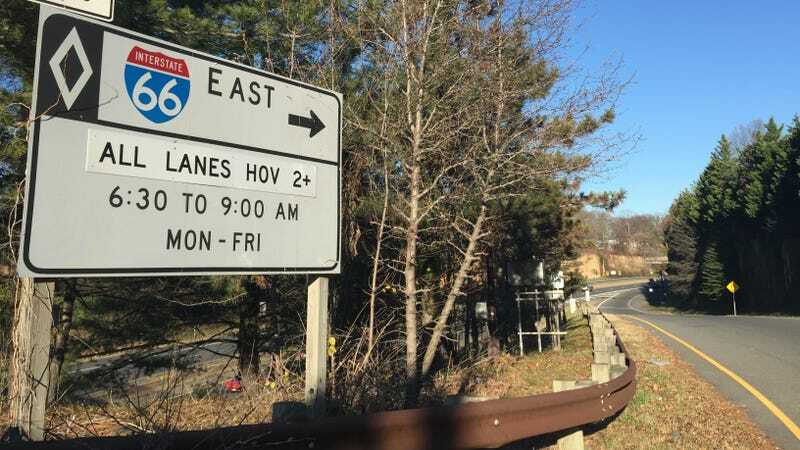 The lane is on Interstate 66 between Rosslyn and Interstate 495, to be precise. Just make sure you have E-Z Pass.